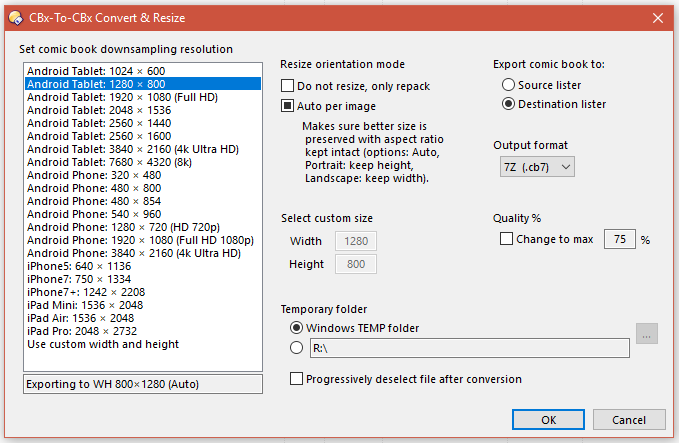 Use to convert and resize (downsample only) comic books from one format to another. It recognizes standard comic book files: .cbr (RAR), .cbz (ZIP) and .cb7 (7z) for both import and export. This should work with most of the comic books in the wild. If dealing with some other format, like PDF comic books, I recommend using ComicRack (http://comicrack.cyolito.com/) to convert first to classic .cbr, .cbz or .cb7. Use either provided button (.dcf) or attached VBScript code with dialog resource (please scroll down). ...this program, since ComicRack can also do it? Well, despite the fact that Directory Opus is more than ideal tool to do it, I wouldn't probably bother if I could find decent software to do it. The fact is that ComicRack has silently abrupted converting, due to some mysterious I/O errors. It might be that it didn't not like my computer being used whilst it was converting the files. Added quality change option. Auto mode is now default. The script is programmed using VBScript over powerful Directory Opus objects. This is my first Directory Opus script. I believe it could be done better but I'm pretty satisfied with the final result, especially since it took me two days from v0.0 to v1.0. However, all suggestions and criticisms are more than welcomed. Is heavily commented. I believe it will help you great deal if you are DOpus script beginner like I was when I started with this little project.
' Added quality change option. Auto mode is now default. dlgO.Control("chkOrientationMode").Label = "Auto per image"
If dlgO.Control("chkDoNotResize").Value Then strResizeMode = "Do Not Resize"
Case "lstResolution", "chkOrientationMode", "imgRWidth", "imgRHeight"
dlgO.Control("tbxNotifySelected").Value = "Exporting to WH " & lngNewWidth & "×" & lngNewHeight & " (" & strResizeMode & ")"
Case "radUseSource":      strUseSD = "source"
Case "radUseDestination": strUseSD = "destin"
Case 0: strOutFormat = ".cb7"
Case 1: strOutFormat = ".cbz"
Case 2: strOutFormat = ".cbr"
dlgO.message = "Comic book file extension not recognized (" + currentFile.name + ")"
This program has been extensively tested against my own (large) comic book collection. Currently, all known bugs have been squashed. 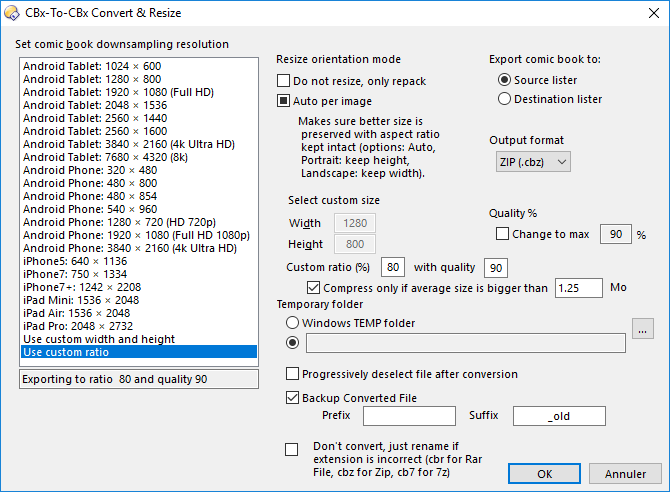 Is there a way to batch shrink CBR & CBZ files? I've got a load of comics from various Humble Bundles and some of them have white borders around the pages, which is annoying when you're looking at a double page spread. I've was thinking about trying to knock up something to unzip the file, crop all of the images to a preset size and zip them back up again, but I'm probably never going to get around to it. Would it be something you'd consider adding to your script? Cool idea, but I'm afraid that's not too simple, as we would need first some app that is able to enter the content, meaning - intelligently and automatically crop around the edges. Personally, I'd be happy with passing simple top-left, bottom-right coords: the files I've been looking at seem to be consistent in border width. Anyway, the layout often leaves whitespace around the panels, which would make it harder to determine where to crop using code, I assume. ImageMagick has an argument that makes it find the borders automatically, based on pixel colors. Is it possible to update your script to add a new option : % of reduction instead of fixed standard size ? 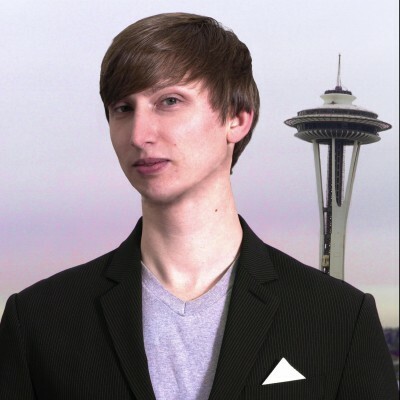 i've previously made a DOS script but your solution is so more elegant ! I guess so, it's been awhile since I created it, but I'll have a look in a couple of days. The time is running short these days. Thanks to the comments of your code, I decided to start the programming. The last time I wrote a program was 22 years ago in C or Fortran and I've never used object programming language. But after 3 weeks of heavy documentation reading I've obtained all that I wanted. Comic Book CBx-To-CBx Convert & Resize v2 !!! Changed the way that conversion is called : before, if the original file contains subfolder the result have only the last alphabetic folder converted. Now, they are all converted. I've been heavily using it for one month, and I've not found anymore bugs. I hope you will find this dialogbox useful.
' Changed the way that conversion is called : before, if the original file contains subfolder the result have only the last alphabetic folder converted. Now, they are all converted. 'Saving for next session the typable field. 'Dopus.output "File " & currentFile.RealPath & " have a correct extension"
Dopus.output " File  " & currentFile.RealPath & " have NOT a correct extension"
Dopus.output " -->Rename """  & currentfile.path & "\" & currentFile.name & """ TO """ & currentfile.path & "\" & currentFile.name_stem & ".cbz"
Dopus.output " -->Rename """  & currentfile.path & "\" & currentFile.name & """ TO """ & currentfile.path & "\" & currentFile.name_stem & ".cbr"
Dopus.output " -->Rename """  & currentfile.path & "\" & currentFile.name & """ TO """ & currentfile.path & "\" & currentFile.name_stem & ".cb7"
strTgtLst = CStr(currentfile.path)  ' source path have been previously initialized wut it can change if you have selected files on different subdirectory on a lister with "Flatview"
If dlgO.control("ChkAutoCompress").value then 'we are checking if the size of the file divided by then number of files is greater than the wanted value. dopus.output "  File " & currentFile & " have a size of " & currentFile.size.cy*10000/(1024^2) & "and have "& FileCountRecursive(currentFile) & " files so  " & (currentFile.size.cy*10000/(1024^2))/FileCountRecursive(currentFile) & " Mo on average"
dopus.output "  File " & currentFile & " have " & FileCountRecursive(currentFile) & " file and it size is " & currentFile.size.cy*10000/(1024^2) & " so  " & (currentFile.size.cy*10000/(1024^2))/FileCountRecursive(currentFile) & " Mo on average -->No convertion needed"
Dopus.output "on compresse dans tout les cas"
Dopus.output CountedRenamedFiles & " files have been renamed"
Nice work. I am however having second thoughts about WinRAR necessity, but, hey - if it works and suits your needs, that's excellent. I'm also not sure why you need a backup option? What I do is: I keep the source (scanned in 300dpi) and just convert it to the destination. Last option to just rename the extension is nice indeed. I am sorry, but I really haven't had a time to make this script even better. Besides, it very well suited my needs even up until now. The main idea of my approach was to reduce the resolution to make the files smaller but still readable at certain tablet. The most of the comics are scanned in 300 dpi, and honestly I see no point in keeping all those dots there, unless you use something of very high resolution. 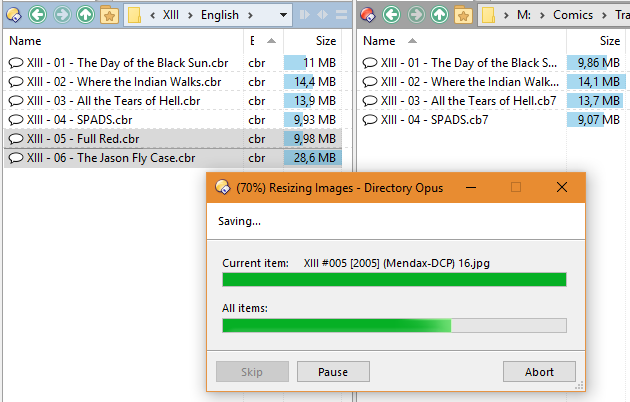 I don't use the "Destination Folder" option: I have a download folder where I use cbx2Cbx then I sort my books. I don't archive comicbook with high DPI, so I needed a way to make cbr smaller. But as you said, I'm very satisfied of what I've done and I couldn't have done it without your base. Could you be more explicit ? Added a short showcase video to the head post on how it looks like in real life. Hi, this is nearly perfect for the use case that i'm looking for, i also got a ton of zip files which i would like to repack into cbz. My problem right now is that i know some of these got mangeld and are old .rar. What i would really like to know is if it would be hard to chage the code to also repack .zip instead of just cbz etc. I'm playing around with the vbs code but to be honest i have no idear what i'm doing here. Or does somebody know of something that will do what i need? The easiest thing to do is to select all .zip and change them to .cbz before running the script. 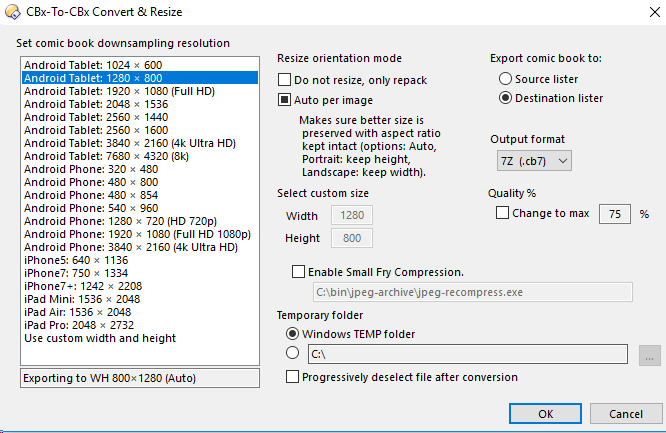 There is a tool call Jpeg Archive, that will recompress a jpeg optimising the compression without reducing the quality. In my experience you can expect a 30% reduction is file size. The page below can explains how it does this, but the short version is. Jpeg is compressed in blocks using a constant compression rate to each block. This tool (when using the smallfry flag) recompresses each bock separately, increasing the compression rate until it starts to see noise. The result is the file looks the same but its smaller. I don't use comics but I found a sample CBZ online that was 11.7MB. When I enabled the smallfry compression the output zip went from 9.39MB (after resize) to 6.84MB (after resize and smallfry). note this was a quick update to see if this was worth trying. Let me know if you have issues or feedback. I have made some updates to suit my use-case which is perhaps not 100% inline with with the original use-case but I believe it should still add value. For our personal photo library we group images by event (xmas 2018, persons 3rd bday....). Then zip each set. I wanted to go through all of the photos and recompress them to using jpeg-recompress.exe and overwrite the original archive set. I never resize the image, I only recompress it. Its still a WIP, back up your original image sets first :). For each temp extracted set move all images to single folder. Instead of finding the child folder with the images. Only overwrite original archive if file count matches. Add compressed tag so I know what has been completed (also skip tagged sets). Added a overall progress dialog that supports Aborting. Added option to hide dialogs for individual steps, including hiding the re-compress dos window. Restructured code to have more functions.